Vitamin D deficiency is common during pregnancy, especially among moms with limited sun exposure, high use of sunscreen, darker skin, and vegetarians.3 Vitamin D maintains proper blood calcium and phosphate levels by aiding in calcium absorption in the digestive tract and increasing calcium reabsorption from the kidneys when blood calcium levels are low.2 This is very important because maintaining proper blood calcium levels ensures calcium will not be taken from bones to maintain those levels. Gestational vitamin D levels have been show to have lasting implications in supporting proper fetal neural and immunological development.4 For the proper development of these systems, it is important to ensure you are obtaining enough vitamin D before, during, and after pregnancy from a source such as PrimaCare™. When choosing a prenatal supplement, it is important to choose one that meets or exceeds the recommended daily intake of 600 IU during pregnancy. 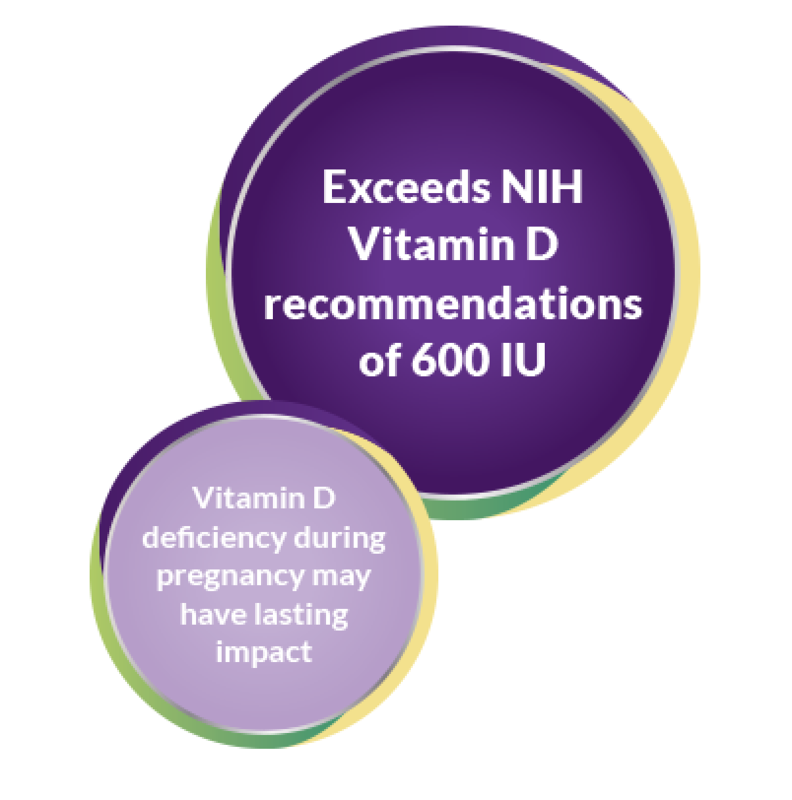 PrimaCare™ delivers 1000 IU of vitamin D, which exceeds the recommended 600 IU, so you can find comfort in knowing you and your baby are receiving enough vitamin D.